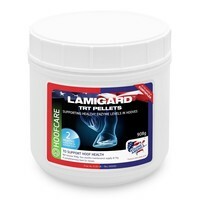 Lamigard Supplement for Horses is a highly effective nutritional support for horses and ponies that are prone to Laminitis. Laminitis is the number one cause for lameness and disability in horses and can occur even under strict diet regimes. Lamigard provides powerful nutritional support to the sensitive structures in the hoof, as well as promoting excellent external hoof condition.